What can happen when scientific research and traditional Native American cultural practices combine to combat an environmental threat? When the topic is the destructive emerald ash borer, the results of collaboration may point the way to reducing the spread of the invasive insect that’s decimated hundreds of millions of ash in the Great Lakes region and beyond. The collaboration showed how the traditional practice of submerging black ash logs until they’re ready to use for basket-making can kill borer larvae and prevent adults from emerging. On a large scale, “this control method has limited application” but it’s significant for tribes with a black ash basket-making heritage, said U.S. Forest Service research entomologist Therese Poland, the project leader and lead author of a new study. “This gives the tribes a tool to continue using black ash for basket-making” while scientists investigate potential “landscape-level” strategies to combat the borer, said Poland, who is based in East Lansing, Michigan. Forest Service and U.S. Animal and Plant Health Inspection Service scientists collaborated on the research with basket-makers from the Match-e-be-nash-she-wish (Gun Lake) Band of Pottawatomi Indians of Michigan based in Allegan County. The emerald ash borer originated in Asia and was first discovered in North America in 2002 near Detroit. Since then, scientists have discovered no effective techniques to eliminate it or control it on a large scale although there is an effective treatment for individual trees. So far, it’s been detected in 25 states and parts of Canada, including Ontario and Quebec, and has wiped out hundreds of millions of trees – with tens of millions in Michigan alone, said Deborah McCullough, a forest entomologist at Michigan State University. “Nobody can count fast enough,” McCullough said of the death toll. She’s been working with traditional basket-makers researching the borer since it was first identified in the state but wasn’t part of the team that wrote the new study. And so far, the most effective method found to control the borer is injecting individual trees with insecticides, a technique that’s feasible for ash along city streets, in small parks and on residential property. However, large-scale biological controls for trees in the wild – wetlands, such as the habitat for most black ash – are yet to be discovered. Most often, the borer is discussed in the context of the death toll on public and private lands. But the new study emphasized how the borer also threatens to eliminate a resource essential to long-standing tribal traditions. The practice “links living members of families with each other, as well as their ancestors and their environment,” it said. 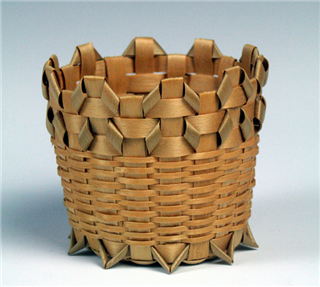 The Michigan Traditional Arts Program has given Michigan Heritage Awards to tribal basket-makers from Haslett, Harbor Springs, Hopkins, Allegan, Mt. Pleasant, Hubbard Lake, Sault Ste. Marie and Hartford for their efforts to continue folk traditions. Native Americans often cut black ash in the winter and spring and submerge the logs for several weeks to a year to retain moisture and provide raw material for basket-making year-round. In their two-year study, researchers submerged borer-infested logs for varying amounts of time and at different times of year in Michigan’s Red Cedar River in Ingham County. After retrieving the logs, they then studied them to determine whether any borer larvae had survived. They discovered that keeping logs in a stream for at least 14 weeks during the spring and for at least 18 weeks during the winter kills all the larvae and prevent adults from emerging. And project leader Poland said submerging the logs for as long as a year and a half doesn’t damage their usefulness for making baskets. The study said the project illustrates the value of meshing scientific and traditional knowledge to seek solutions to environmental problems. “The challenge of responding to invasive species at the same time as preserving indigenous cultural traditions requires information provided by both traditional ecological knowledge and western science,” it said. The study appeared in the journal Agricultural and Forest Entomology.